At the end of part one of this two part Oakland taco adventure, I could have easily called it a night. A successful one to boot. 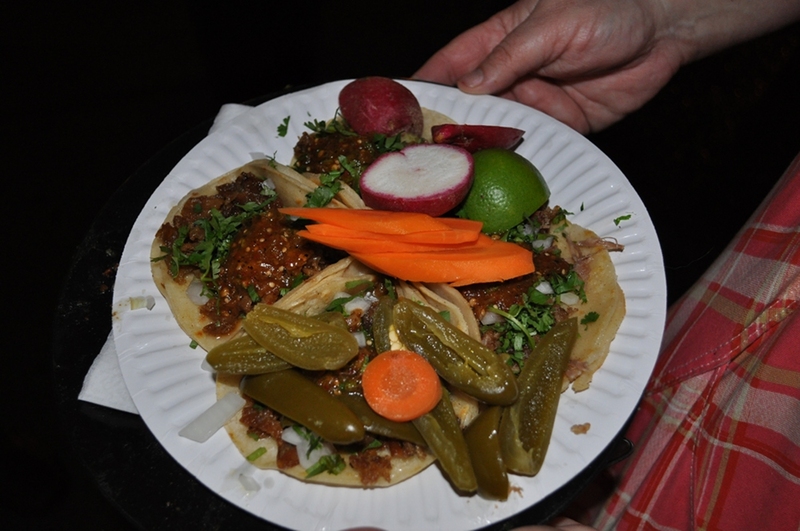 There was tacos, sopes, huaraches, glorious seafood and we even slid down a token vegetable; corn. Yet, with the sun dipping nicely along its setting path, Ruth led us on like hobbits in search of Mordor. First up, and probably for as much as a digesting break, as a visual stimulation; Mi Pueblo Food Centre. The same size, and following the same basic layout as your neighbourhood Safeway, Mi Pueblo is a Mexican food lovers dream. From the fresh tortilla’s made right in front of you, to the common & not so common cuts of beef & pork. Mexican pastries, candies, umpteen types of salsa’s, and so on and so on. Pretty much everything from the dried section to the live, made me just a little jealous of the locals of who get to live in the area. One heart warming moment, and one that brought me back to my time in Central America, was the overhead announcements, which were in Spanish. Nothing says ‘not-in-your-backyard’ like that. If we hadn’t planned on continuing our eating adventure so soon, I think we would have stopped in at the busy in-store taqueria, or picked up some sweet snacks. No need for snacks say Ruth…. 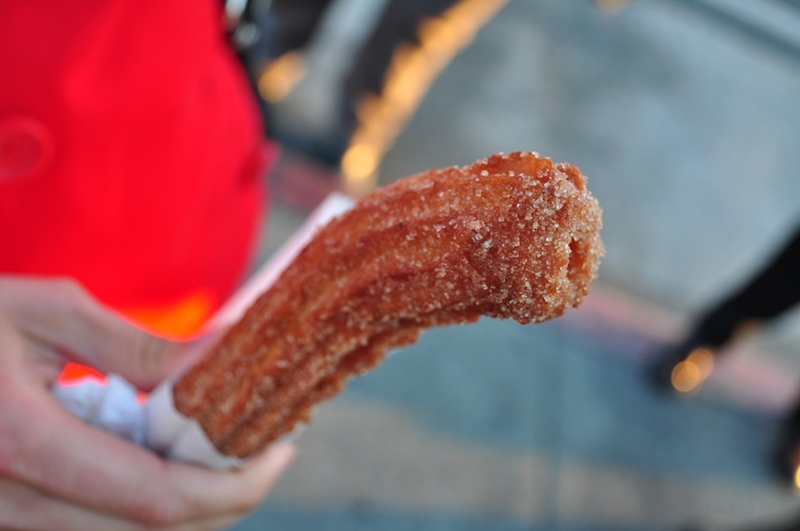 We soon found ourselves back outside in the cool Oakland air, getting chummy with a young man and his churros cart. There are a few types of this Spanish donut scattered around, with this fatter version to be one that is more common to me. The young man’s station was very simple, with his batter covered KitchenAid and deep fry station adding a layer of glistening grease all over his cart. Ringing in at a buck a piece, Sarah and I were happy to share this giant cinnamon and sugar coated treat. I promise that if you have any doubts, let me tell you this treat (when it’s fresh) will bring you right to the mini donut land you so love. As we wandered down the streets of Oakland, Ruth continued to provide great commentary for the surrounding blocks and her stories eventually led us to El Ojo de Aqua. Operating two taco trucks, this taco truck actually rents the small building in its parking lot so customers can use the washroom. Imagine that. A taco truck, with no ambition to get bigger, but enough care to provide a rest room. Amazing. 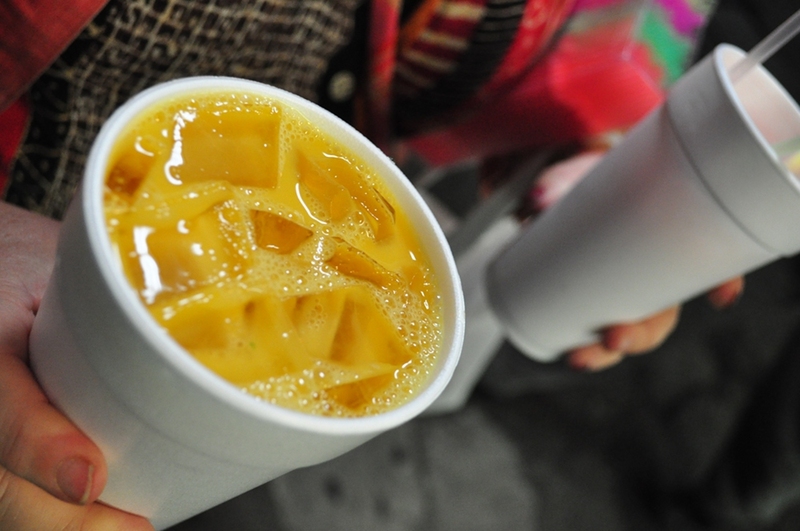 Sarah and I were told the Aqua Frescas were to die for here, and as such, soon found ourselves with both of the days offerings; mango & guava. The combination of sugar and ripe blended fruit provide a bright and refreshing drink. Although I think at this point in the night, the cold drink would have been better suited for a hotter time of the day. I’m not a juice guy at heart, so a few sips was all I really needed before I was good. After all, I was here for the tacos! Suadero was taco number one here, and while it may sound unusual, it’s actually just a cut from the brisket. Smooth, and tender, it made for a great tasting beef taco. The cabeza, or head, taco was top notch as per usual. With the entire cow head roasted and pulled apart, the kind folks here put together a taco with an almost perfect mixture of fat and meat. Hot damn was this good. After walking for probably three and a half hours, we arrived at what would become our last destination. Here, located in a restaurant parking lot, El Novillo is exactly what I came to Oakland looking for. A straight up, no messing about taco truck. 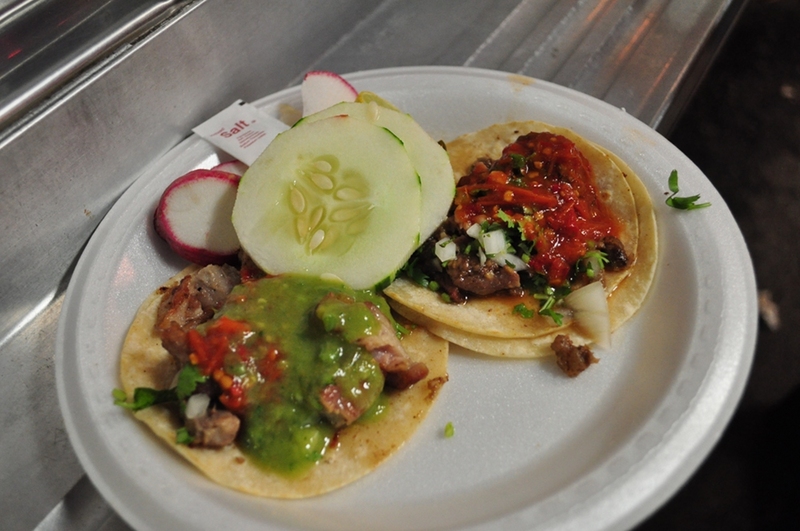 With a wide array of taco fillings, El Novillo is known for one option in particular; tripas (pig intestines). Ordering three tripas and one carnitas taco, I could have easily thrown the carnita version to the dogs after my first of many glorious bites of pig intestines. Wonderfully chewy, with an almost aromatic and crispy bacon-like edge, these were taco heaven. Seriously, and I don’t mean to be over the top, but Oh My GOD! As we continued on our journey finding shop after shop closed for the evening (seriously, we tried to eat at three more stops! ), I found myself in some sort of happy and sad state. Sad that I knew this night was coming to a close, and while we may a large dent, I personally could have eaten more. After all, I think I spent that last few months planning for this experience. Which is in part why I was so happy. Having been guided around Oakland by one of America’s taco experts was beyond anything I could have planned. Her generosity, kind spirit, and knowledge will make this something Sarah and I will never forget. But, the best part of all…finishing our night with what what I consider to be the best taco I’ve ever eaten!! 1) *shakes fist* You are making us drool on our keyboards right now!!! lo que es un viaje. Tal vez sea hora de levantar juego, recibe una transferencia de la compañía a los America. Y comer bien durante algunos años. Lo hice. Me hace falta. What a gift to yourselves and we readers! I am forwarding the link to your posts about this to Lauren (my daughter living in Palo Alto) She is close by and would really benefit by knowing all of this – she may b e aware of some of it – but not all, for sure.